The choice of Colorado for this year's Big Day highlights the shortgrass prairie ecosystem and its conservation needs, exemplified by the Lesser Prairie-Chicken. Photo by Gerrit Vyn. Our second annual Global Big Day takes place May 14, 2016, and everyone’s invited. If you see or hear a bird (or 100 birds), anywhere in the world, you can take part by entering your sightings into eBird. Team Sapsucker, left to right: Chris Wood, Jessie Barry, Brian Sullivan, Andrew Farnsworth, Tim Lenz, Marshall Iliff. 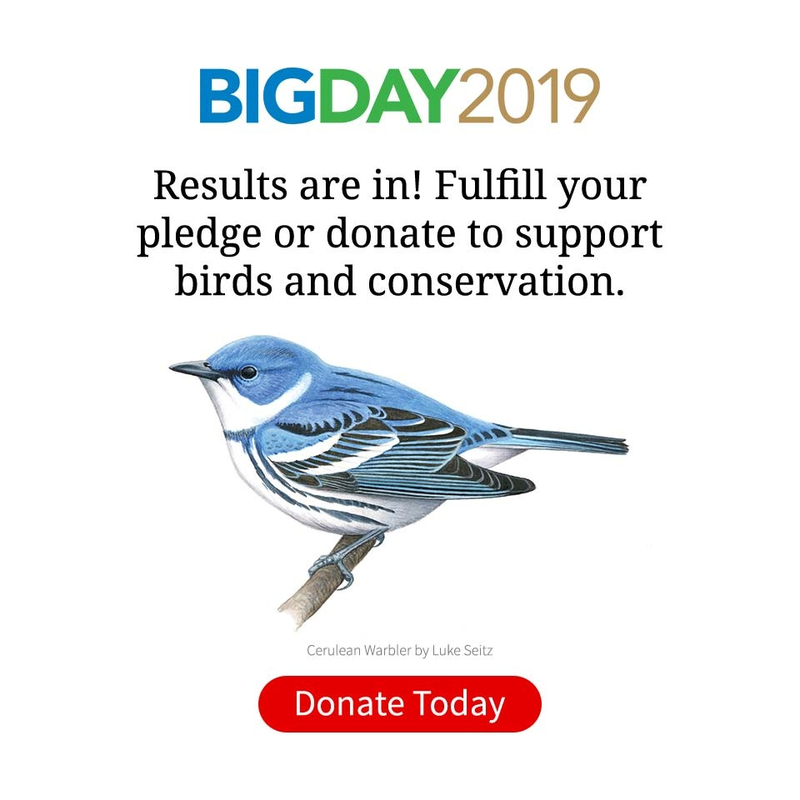 Big Day is our largest fundraiser of the year. Typically, supporters pledge a specific amount for each species the team identifies—putting a little extra pressure on the team to get every species they can. Sponsorship from Swarovski Optik ensures every dollar raised goes directly to conservation programs. One fun quirk to this year’s Colorado route: the lower species tally means you can pledge more without breaking the bank! For instance, pledging $0.50 per bird will likely result in a roughly $100 gift. Special offer: Guess how many species Team Sapsucker will find on Big Day and you’ll be entered to win a pair of Swarovski EL binoculars —just like the Sapsuckers use! Please make a pledge today. The event will be a homecoming for team captain Chris Wood, who grew up near Denver and remembers early mornings spent watching Lesser Prairie-Chickens with his dad more than 30 years ago. This year’s Big Day brings attention to the decline of that shortgrass prairie—the team’s route traverses a former Lesser Prairie-Chicken stronghold, but precious few of the birds remain there today. Over the last century, America’s great prairies have seen some of the sharpest bird declines of any ecosystem. But recent restoration efforts have curbed the decline of grassland birds, according to the 2014 State of the Birds report, indicating that it’s never too late for conservation to work. Members of the three Redheads student birding teams in 2016. Photo by Andy Johnson. On the same day Team Sapsucker is scouring Colorado, our student teams will be in New Jersey competing in the 33rd World Series of Birding. Collectively called The Redheads in honor of Cornell’s “Big Red” mascot, the teams will compete in three divisions—Cape Island, Cape May County, and “Big Stay”—all to raise money for undergraduate research. Each year, the Cornell Lab mentors more than 100 undergraduate students, giving them hands-on experience in the study and conservation of birds and other wildlife. Money raised by the Redheads goes directly to support undergraduate research projects—and in the past has taken students to once-in-a-lifetime opportunities in Borneo, Ecuador, and elsewhere. Pledge to the Redheads. This year marks the Sapsuckers’ first Big Day without a sea coast in sight. Choosing a landlocked state means that astronomical, 290+ species days like they’ve had in past years will remain well out of reach. And yet even without sea watches, saltmarshes, estuaries, and mudflats, Colorado still has more than 200 species on offer. How? The team’s route will link up these points of the birding compass in a relatively narrow, 150-mile stretch of Colorado from Pueblo to Lamar. High mountains will offer tundra species such as American Pipit and boreal birds like Pine Grosbeak and American Three-toed Woodpecker—as long as snow doesn’t close the roads. Farther downslope they’ll look for western species such as Black-throated Gray Warbler and Pinyon Jay. Then they’ll turn eastward and follow the Arkansas River, detouring through cholla-studded desert for southern specialties like Curve-billed Thrasher and shortgrass prairie to find Mountain Plovers. Along the river lie a series of reservoirs that should hold waterfowl, and isolated stands of cottonwoods at places like Chico Basin Ranch should concentrate migrating songbirds. Near Lamar, coveted eastern species such as Northern Cardinal and Red-bellied Woodpecker reach their westward limits. They’ll end the day listening in the darkness again, this time for marsh birds such as Virginia Rail, Least Bittern, and the secretive Black Rail. Follow along with Team Sapsucker on Facebook as they scout during the week leading up to the Big Day and during the day itself. Once all the birds have been tallied, the team hopes to have raised $500,000 to support the Cornell Lab’s conservation programs. Support from the team’s sponsor, Swarovski Optik, means that every donated dollar goes straight to conservation. Please pledge here.